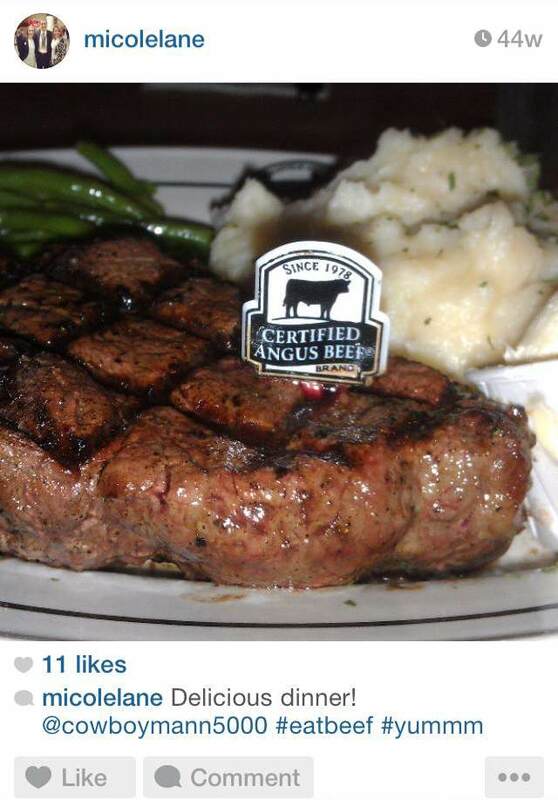 If you follow me on social media, one thing will become blatantly obvious: I like a good steak. As a college student, when I eat steak it’s a pretty special occasion and as a communicator, I have a need to post about it. My Instagram (okay, and Facebook and Twitter) feed is filled with photos of delicious bovine I’ve happily devoured. One photo in particular was taken last summer at a great steakhouse here in Manhattan, Kan.
One big ol’ slab of Certified Angus Beef® straight from Little Apple Brewery’s kitchen. Little did I know that nearly a year later I’d be working for the brand that was skewered into my dinner. For we connoisseurs of excellent beef, only a quality steak cooked to perfection will satisfy a craving. And for the men and women who produce the cattle that end up as the divine steaks we enjoy, nothing less than the best will do. Luckily, there are some steakhouses that fulfill this need right in the heart of cattle country. June is National Steakhouse Month and I’m always looking for an excuse to eat steak (hopefully you are, too) so I thought I’d share some of the great restaurants serving up CAB in the back yards of the people producing it. If you are traveling along under the Big Sky, The Rex in Billings, Mont., has a menu fit for its Latin namesake. Here, you’ll get to enjoy your CAB in a historic building once frequented by the likes of Buffalo Bill, Calamity Jane and Will James. You might like The Cellar in Kearny, Neb., so much that you’ll try to buy it. That’s how the current owner came to run a restaurant that people now drive hours to enjoy. Home of 2013 Nebraska’s Best Burger award, the menu focus is on all the best, with CAB of course. When venturing through the plains of Western Kansas, Samy’s in Garden City won’t leave you disappointed. Amro Samy and his staff ensure a satisfying beef-eating experience for the people who make their living creating some of the best beef in the world. This family-friendly restaurant has more than great beef. Your visit could include anything from a music deejay to dueling pianos. Bill and Bev Roe started Pedros Angus Steakhouse, and have since moved from the plate to the pasture. Now seedstock producers, their restaurant still serves CAB and authentic Mexican food in Oxford and Fairfield, Ohio. Whether you are looking for a sirloin or a steak fajita, the quality of the beef is guaranteed. And after a day at the lake, you’ll enjoy Domenico’s at Osage Lake, Mo., where CAB mixes well with the Italian-casual menu. Owner Tony Cicerelli says even cattle people are pleasantly surprised with his steaks. Their specialty is charbroiled CAB prime rib, a treat that Tony guarantees is unlike any other. Of course my local favorite where that picture was taken is Little Apple Brewery. After a drive through the Flint Hills dotted with black cattle, I love to enjoy the food and atmosphere at Little Apple. They focus on great steaks, the best you can get. For proof, I might point to their multiple Kansas Beef Backer trophies and the 2011 National Beef Backer Award from the Beef Council. After a hard day working cattle, these places should hit the spot with beef that is sure to please any cattle producer or beef lover. Just thinking about all these great places (and potential social media posts) has me salivating, so I’m off to celebrate National Steakhouse Month! Hope to see you there!